Since 1996 the Vh1 Do Something Awards honor athletes, music artists and actors that have portrayed a social issue during the year. Back in August we (Robin Hood) were nominated for one of these awards. After joining forces during our benefit, Robin Hood and Lady Gaga launched a contest on Facebook for a $1 million giveaway to support New York City teens living in poverty. The objective was to raise awareness of the needs that exists in the city for homeless teens, while allowing fans to vote for one of the five organizations up for the grand prize. Within a week we garnered over 1,036,000 votes and a tremendous amount of support. We were honored to be nominated and even more honored to win the award. 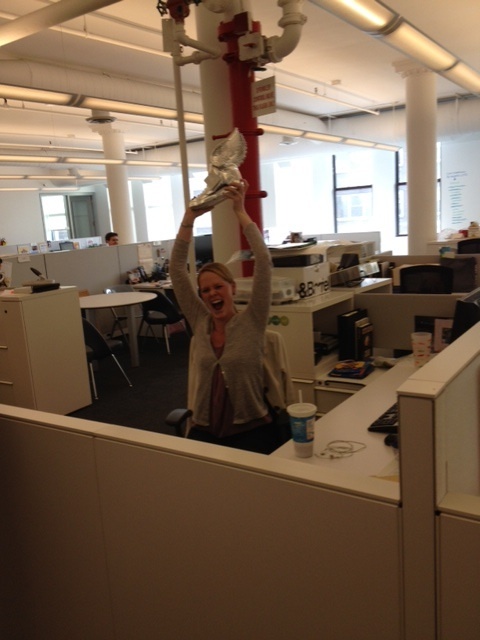 As a result, the trophy, a giant silver shoe with wings attached, made its way to our office. 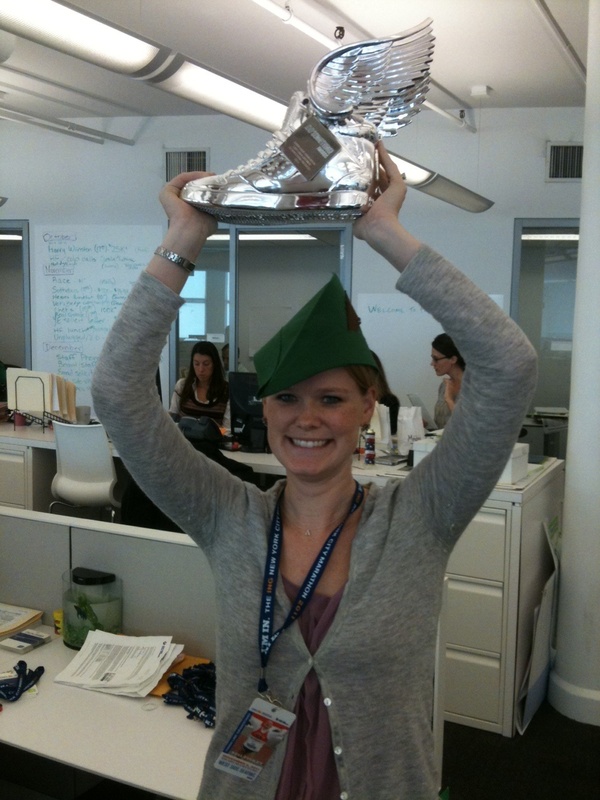 In typical Robin Hood fashion, we decided to share the award with everyone in the office. Since the silver shoe made its way to “the hood” it has become an award that we share with each other when someone in Sherwood Forrest “does something awesome.” Obviously it has been my goal to win this award since its inception! 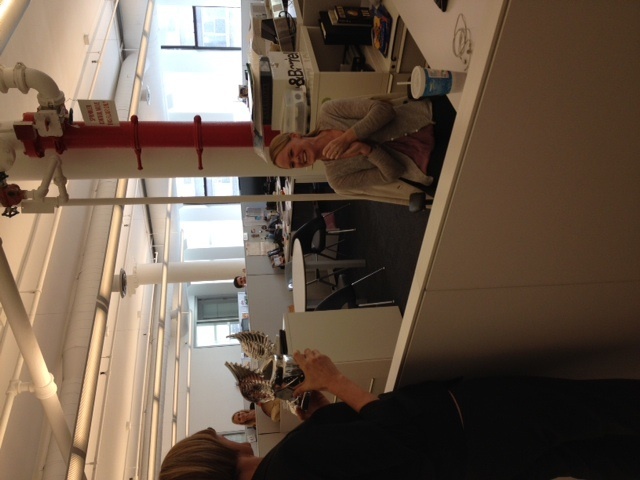 For those of you not on the eighth floor, Molly has just been awarded the fancy silver Do Something shoe. Molly has been slaving away tirelessly to make sure that the Robin Hood marathon runners are well prepared for this weekend. She’s organized weekly runs, weekly spin class, fancy shirts and all manner of other events and fundraising so that the runners run well and that they raise oodles of money for poor New Yorkers. Additionally, although the two concerts are now in the rearview mirror, Molly had the (in my view) difficult and thankless task of calling many of our donors and giving them the opportunity to choose between the rescheduled BEPs concert and the Sting concert the following evening. Molly was sitting near my office on 7 at the time, and she must have made the same phone call about 1000 times. And the net result? Two terrific events that each raised money from donors excited to be at their concert of choice. Definitely embodies the spirit of Doing Something! 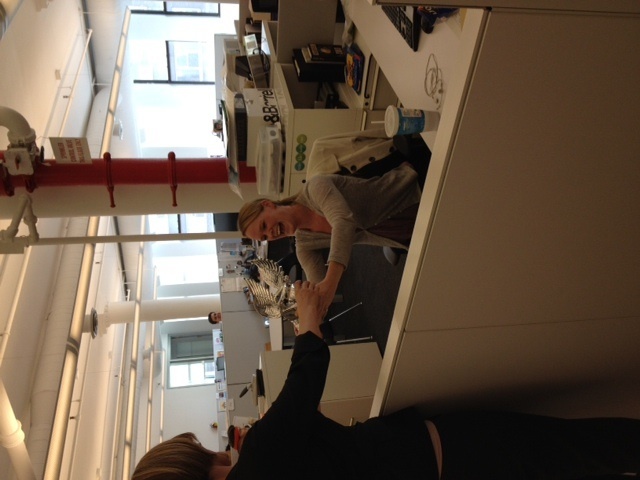 Please congratulate Molly for Doing Something! I would like to thank my family for supporting me for the past 28 years. I would also like to thank my loving husband who has dealt with my stress, crankiness and has definitely taken a back seat to my job for the past week or so. I promise that things will get better once the marathon is over. Thank you to Robin Hood for being the best place ever to work! I want to be robin hood and work.in sherwood forest and see the fancy silver shoe…..are they hiring coaches?!?!? Can’t wait to stalk….I mean track…the robin hood runners on sunday!! !